You are here: Home > News > Straid Congregational Church: Nearly Listed, Nearly Demolished- Now Saved! A pre-dawn plan to demolish the 200 year old Congregational Church in the Co. Antrim village of Straid was foiled on Saturday morning, 6th January 2018. This highlights once again the gaps in NI listing legislation, but also demonstrates that with determined, well advised, community action, backed by prompt and decisive reaction by a local Council, such acts of cultural vandalism can sometimes be stopped in their tracks. 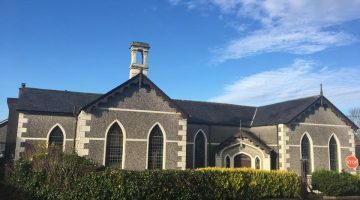 The Church, which is the oldest of its type in Ireland, together with its attached former school was assessed suitable to be B2 listed by the Historic Environment Division of DfC following requests to list from the community and UAHS. This was endorsed by the Historic Buildings Council on 13th December 2017 with the Church and Antrim and Newtownabbey Borough Council notified on the same date. However, as most recently with the demolitions in Belfast’s North Street, late 2016, this left the Church building with no statutory protection until endorsed by the Council at its next meeting and the subsequent issue of final listing notice from the Historic Environment Division (HED). This therefore constitutes a legislative loophole that may leave this and other buildings at increased risk of destruction and demolition in the interim period. 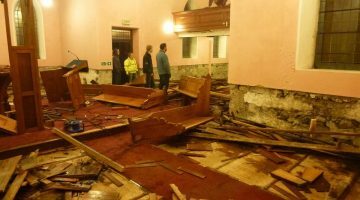 The existence of the legislative gap may have been seen to encourage a group within the congregation who favour a new build church to proceed with the smashing of the interior of the church during Friday night. 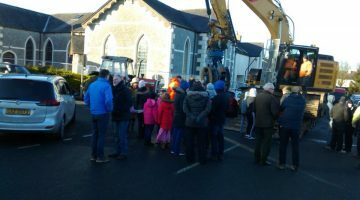 However, when the demolition contractor arrived at 5am on Saturday morning a large contingent of the congregation and local residents opposed to demolition had already gathered. A stand-off resulted with the village blocked to traffic and the PSNI on site. UAHS was able to advise on site and on social media that the only way to protect the building was if Antrim and Newtownabbey Borough Council was able to issue a Buildings Preservation Notice (BPN) on an urgent and immediate basis. Ensuring receipt of such requests is more difficult when such incidents occur on a weekend or bank holiday when council offices are closed. 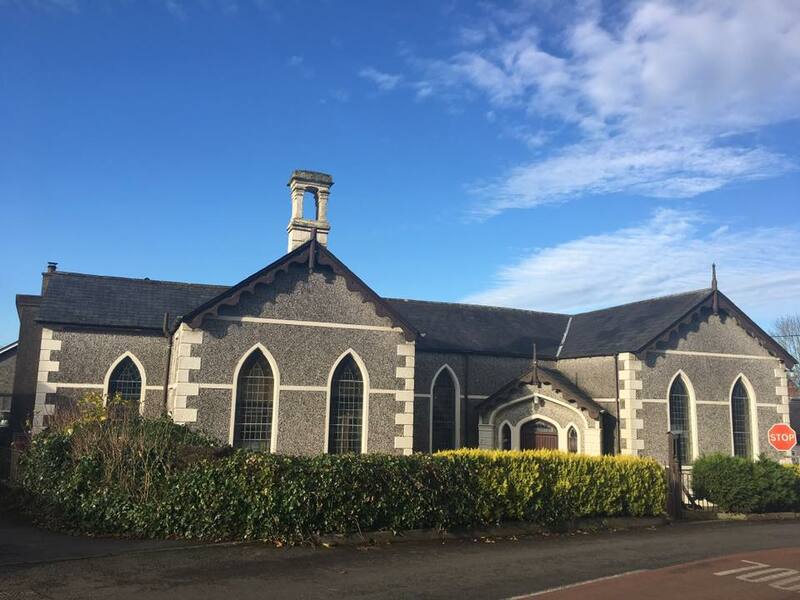 All due credit therefore, must be given to the Deputy Mayor and local MLAs who were present in support and worked with Council Officers, staff of the Historic Environment Division (HED) and local people to enable a BPN to be served on the church in the space of two hours. This case serves as a good but rare example of success delivered through co-operation. 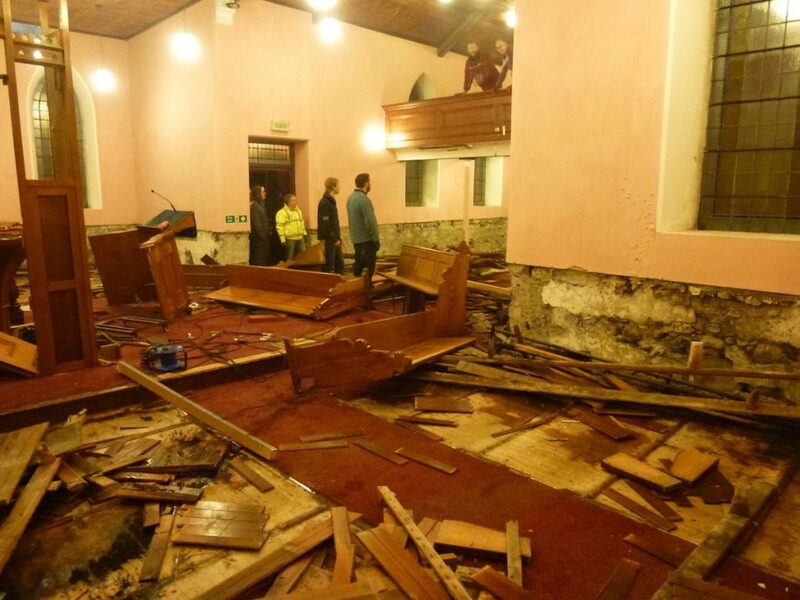 However the interiors of the church have been seriously damaged and but for a happy blend of availability, good will and expertise on the site and at the time, this would have been yet another statistic added to the loss of built heritage in Northern Ireland. #HelpHeritage #HaveYourSay! Join UAHS’ call for automatic interim protection for buildings being considered for listing.